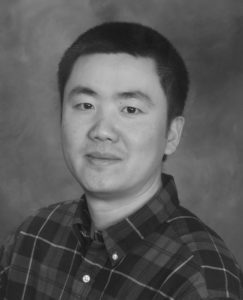 Ming Zhao, PhD, associate professor of Medicine in the Division of Cardiology was senior author on the paper published in the Proceedings of the National Academy of Sciences of the United States of America. Northwestern Medicine scientists discovered a previously-unknown mechanism of disease behind a specific autoimmune disorder, findings published in the Proceedings of the National Academy of Sciences of the United States of America. 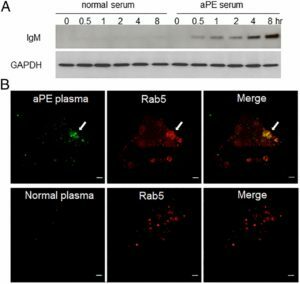 The scientists observed antibodies that targeted phosphatidylethanolamine, an important phosopholipid, from within the endosomes of cells. 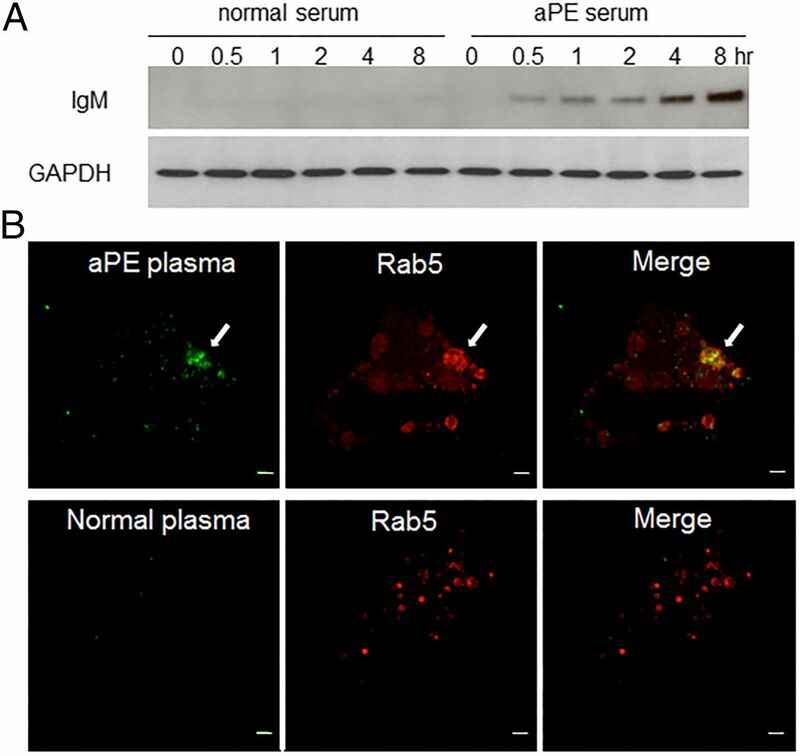 This discovery was the first observation of a pathogenic mechanism behind anti-phosphatidylethanolamine (aPE) autoimmunity, an immune system disorder that’s been correlated with thrombosis, transplant failure and pregnancy loss. Autoimmune diseases usually develop when antibodies — proteins which neutralize pathogens — erroneously attack cells while circulating through the bloodstream. To target those cells, the antibodies bind to accessible antigen targets on the exterior surface of cells, but Zhao and other investigators had been unable to identify an accessible target for aPE — until now. “The discovery was made somewhat by chance — we left a binding study overnight and discovered, to our surprise, that the antigen is accessible after antibodies are internalized into cells,” said Zhao, also a member of the Robert H. Lurie Comprehensive Cancer Center. Plasma cells showing accumulation (green) of antibody within cells (red). It’s important to note the inflammatory response may be the principal effect of aPE, according to Zhao, because it means anti-inflammatory treatment is likely to be more effective than anti-coagulants. These novel discoveries shed light on how cellular vulnerability to aPE is mediated and explain some of its clinical symptoms, according to the study. Because endosomes are an integral part of nearly every type of cell, linking the activity of aPE antibodies to clinical symptoms will be a priority for scientists in future investigations, Zhao said. Songwang Hou, research associate at the Feinberg Cardiovascular Research Institute, was the lead author on the study. Other Northwestern co-authors include Heike Fölsch, PhD, research assistant professor of Cell and Molecular Biology, Joan Cook-Mills, PhD, professor of Medicine in the Division of Allergy and Immunology and Rosalind Ramsey-Goldman, MD, Solovy/Arthritis Research Society Research Professor and professor of Medicine in the Division of Rheumatology. Funding support was provided by National Institutes of Health Grants 5R01HL102085 and GM070736.